The Indian temple is not a building; it is an image, a conception of divinity. While it is both natural and necessary for the image to be projected into a spatial arrangement and concretized by a structural movement, the image does not depend upon such activities for its continuance. The temple is an enclosure to the icon, and centres round the icon. A temple must be built for the icon, and not an icon got ready for the temples, for a temple is really an outgrowth of the icon, an image of the icon. One cannot think of a temple without an idol. Bhu pariksha: Examining and choosing location and soil for temple and town. The land should be fertile and soil suitable. Karshana: Corn or some other crop is grown in the place first and is fed to cows. Then the location is fit for town/temple construction. Vastu puja: Ritual to propitiate vastu devata. Salyodhara: Undesired things like bones are dug out and removed. Nirmana: Then foundation is laid and land is purified by sprinkling water. A pit is dug, water mixed withnavaratnas, navadhanyas, navakhanijas is then put in and pit is filled. Then the temple is constructed. Murdhestaka sthapana: Placing the top stone over the prakara, gopura etc. This again involves creating cavities filled with gems minerals seeds etc. and then the pinnacles are placed. Garbhanyasa: A pot made of five metals (pancaloha kalasa sthapana) is installed at the place of main deity. Sthapana: Then the main deity is installed. Pratistha: The main deity is then charged with life/god-ness. Let us now try to briefly go over some significant stages commonly involved in temple construction, in a summary form. The temple construction project begins with the appointment of a team of experts headed by a qualified and an experienced Sthapati, the Acharya, the director for the temple construction project and the Shilpi (sculptor). They are the key figures in the construction of a temple. The first step is, of course, to look for a proper site. This involves examination of all aspects relating to the location, the extent, the quality of Soil, the water source, the environment and astrological suitability of the site. This elongated process goes by the name: Bhupariksha. The Temple construction, in the past, often began as the nucleus of a new village or a township which went by names such as grama, kheta, kharvata, durga, pura, nagara etc. Mansara explains that the proposed site for setting up a township should be determined by its smell, taste, shape and direction, sound and touch. The preferred sites for such townships should be along the banks of a river or near a tank or the seashore. Else, the water table had to be at about eight feet (height of a person standing with raised arms). Manasara, an ancient text of Shilpa sahstra, recommends that if a town has to be located along a river bank it should then be at a height sloping towards the east or north (praganuthamuttara natham samam va bhumi) ; and, it should be situated on the convex side of the river bend. The text mentions Varanasi situated along the convex side of the river Ganga; and, presenting a semi-lunar phase as a classic example that satisfies this norm. And , similar is the case of the ancient city of Madurai located along the convex side the Vaigai. It is said; the ancient city of Madurai was re-designed by the King of Madurai , Vishwanatha Nayak (1159–64 CE), in accordance with the principles of Shilpa Shastra. The city was built with the temple dedicated to the Goddess Sri Meenakshi at its heart. The city was square in its shape, aligned with the four quarters of the compass. 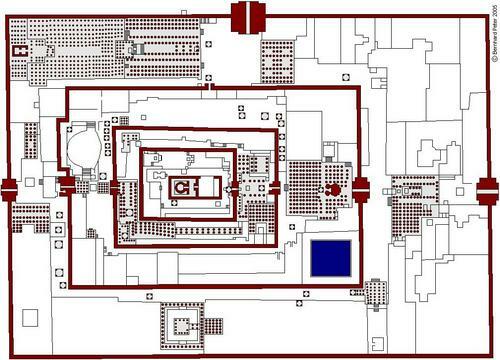 The area between the temple at the center and the outer rim of the city was divided into series of concentric squares. And, each enclosure was provided with four gateways, with Gopura atop each entrance. The perennial river Vaigai curved its way along the edge of the city. The temperatures had to be modest in summers and winters (sukha – samsparsa). The sites with inclination (slope) towards its Eastern or the Northern side, to receive sunlight, were preferred; or the site had to have equal elevation on all the sides’. The sites located to the west of a hill were avoided. The Village boundaries should always be marked by rivers, hills, bulbous planes, caves, artificial buildings, or trees such as milky trees. Etc. The ground (Desha) is classified into three categories on the basis of sixteen criteria of physical features of the land (desha-bhumi). The three broad categories are: the Barren land where warm winds blow is Jangala; the second is Anupa, beautiful countryside with moderate climate and water sources; and the third Sadharana is of the average quality consisting vast stretches of unused land areas. The best land is Anupa, which abounds in lotus and lilies (supadma) and which inclines towards east or north. As regards the colors of the soil, the colors could be white, yellow, red or black. A land which abounds in any one of these colors is preferable; a combination of colors, mixed colors are to be avoided. Sandy soils with assured supply of water are preferable. However, some texts mention that soils of white color with ghee-like smell ; and, soils of red with blood-like smell are preferred. Soils, yellow in color smelling like sesame oil is middle. And soils , black in color smelling like rotten fish are to be avoided. The soil should have pleasant odor as of flowers, of grains; of ghee, of cow urine etc. The soils with obnoxious odor as of excreta, dead bones, of corpse, of fermented liquor etc should be avoided. The taste of the soil too should be acceptable. The taste of sweet is said to be best. The others in order are astringent (kashaya), bitter and pungent. The soils tasting sour, salty should be avoided. As regards the sound tested by pounding the soil , the soils giving out sounds of musical instruments like drums (mridanga), neighing of horse, or like waves of the sea are considered best. The next in order is the soils that sound like birds, animals like sheep , goats etc. And, the soils that sound like donkey, drainage, broken pot etc are to,be avoided. The soil should be pleasant to touch; warm in winter, cool in summer and one should generally evoke a happy feeling. There also other tests for determining the strength of the soil by digging test pits, filling them with water or driving pegs at various points are discussed in various texts. The site should have in their surroundings milky trees (four variety of trees having milky sap:nigrodha, oudumbara, ashvatta and madhuka), trees bearing fruit and flowers; and also plenty of anti- malarial Neem (nimba) trees. The site should be suitable for growing Tulasi, Kusha, Dharba, Vishnukrantha, Hibiscus and Dhruva grasses and flowers. The site should be large and should evoke pleasant feelings (manorama) and should generally be acceptable to all. 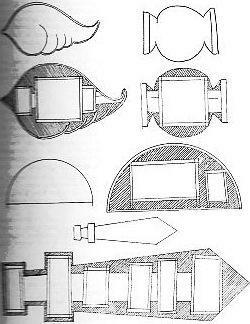 The Shilpa text Shiva-prakasha in its chapter titled vastu-bhumi-bedha, describes sixteen (Shodasha) types of temple layouts: the Square (Chandura); Rectangle (Agatra);Trapezium ( with uneven sides – like a cart – shakata); Circle (Vritta); Elliptical (kritta vritta); triangular (dwaja); diamond or rhombus (vajra) ; Arrow (shara);umbrella (chatra) ; fish (meena);back of a tortoise (kurma);conch (shanka); crescent (ardha-chandra); pot (kumbha);sword (khadga); and lotus (kamala). These layouts have specific applications; and are not to be used generally. For instance: the back of a tortoise (kurma), pot (kumbha), conch (shanka) and lotus (kamala) are recommended only for Vishnu and Shiva temples. Similarly the Square (Chandura), Rectangle (Agatra), fish (meena), diamond or rhombus (vajra) and sword (khadga) are recommended for Devi temples. The rest of the lay outs are for other (lesser) deities. But all texts generally agree that the square or the rectangular shape of layout are the best and most auspicious. Varaha-samhita calls such layouts as Siddha-bhumi, the best of all. In case the layout is rectangular, the North South dimension should be greater than East-west dimension. It is also said, it would be better if the elevation on the west or the South is slightly higher. Generally , the Vastu Shastra recommends five types of town -shapes: the Square (Chandura); Rectangle (Agatra); Circle (Vritta); Elliptical (kritta vritta); and circular (Gola). A diamond or a rhombus shape is not recommended. A bow shaped town is considered powerful. The square shape is considered secure and amenable to progress. The plan for the village or the township commences with placing the temple right at the centre and expanding the layout in layers and layers of streets, and entrances, in accordance with the appropriate Vastu Mandala. The entire township is laid out in the form of a square. If a square shape is not possible then the city could be laid out in a rectangular shape.The following are a few of the general recommended features of a city. 1. 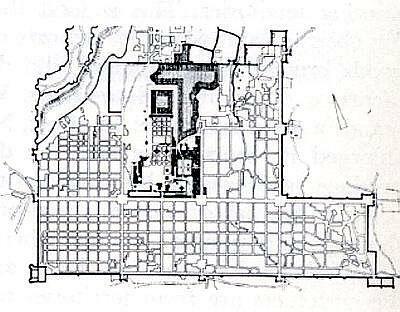 The city should appear as a big square or a rectangle comprising of so many small squares, separated by the roads that run north-south and east-west. 2. Fortifying walls should be built round the city. 3. The city would be divided into four parts by two broad royal roads (Raja marga) that run north-south and east-west. Their width would be about 10 to 12 meters. 4. To go round the city, on the interior side of the fortifying wall, a broad road would be built. .
5. The dwelling places of the people of various castes and professions are identified. 6. The markets would be in North East and prisons would be in South West. 7. Places like the royal palaces should be in the East. 8. And in case of temple cities , say as in the case of Srirangam and Madurai, the principle temple would be at centre of the city, in the Brahma Sthana.. And, there would be fortifying walls built round it; and in which the temples of other deities are accommodated.. And the place beyond that fortified wall would belong to the humans and other beings. The best example of such a formation is the ancient city of Madurai. 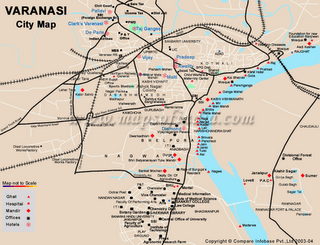 Please check this site (Madurai, the architecture of a city by Julian S Smith) for the layout map of the old city. 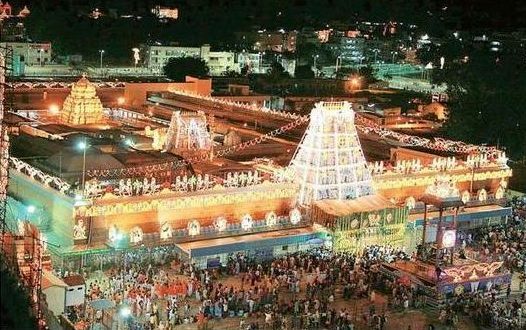 Another example of a well laid out Temple Town is that of the Tirumala Tirupati .The holy deity of the temple has a history dating back to about two thousand. The temple structures around it, developed in stages, spread over several centuries. The temple is on top of a hill series, at about 3200 ft above sea level. But, the temple, per se, is located in a depression surrounded by raising hills on its three sides; leaving open an approach from the North-East. The temple is enclosed in a box-like formation, with bulging mounds of about fifteen feet, rising in all four directions. Some parts of these mounds now been levelled to make room for “developments”. The outer walls of the temple, enclosing an area of more than two acres, measure 414feet (E-W) and 263(N-S), in length. The temple complex is in a rectangular shape, with the depth (Aaya) being more than the breadth (Vyaya). .The streets (maadas) running around the outer walls of temple are of uneven length. The North-South streets running by the side of the outer walls measure 800 feet, in length. The west side street (behind the temple) measures 900 feet in length; while the East side street (in front of the temple) measures 750 feet, including the swami-pushkarini area. The main temple occupies only one-fourth area of the total area; and , its Eastern and Northern side are open areas. The temple is facing east. The Garbhagriha is situated slightly to the South-West. The Swami Pushkarini (water element) is located to the northeast of the temple. A waterfall is also in the northern direction ; and, the water from it is used for the holy bath of the main deity every day. The Kitchen is in Southeast (Agni), while the temple store houses for storing grains and other items required in the kitchen are in the North-West and North side. The outer walls of the temple, enclosing an area of more than two acres, measure 414feet (E-W) and 263(N-S), in length. The temple complex is in a rectangular shape, with the depth (Aaya) being more than the breadth (Vyaya). .The streets (maadas) running around the outer walls of temple are of uneven length. The North-South streets running by the side of the outer walls measure 800 feet, in length. The west side street (behind the temple) measures 900 feet in length; while the East side street (in front of the temple) measures 750 feet, including the swami-pushkarani area. 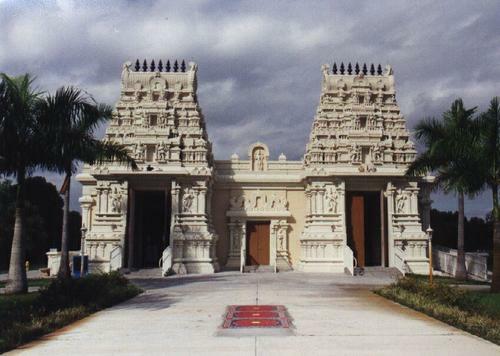 The temple faces east and has only one entrance, about 11 feet wide. There are three enclosures or Pradakshina-pathas, for circumambulating the temple.The main entrance leads into Sampangi Pradkshina , of about 120 feet in depth.There are are a number of pavilions within this enclosure,; such as Prtathima mantapa, Ranga mantapa, Tirumalaraya mantapa and others. The Dwajasthamba is in front of the Tirumalaraya mantapa.Presently this enclosure is closed to pilgrims. The Second enclosure is the VimanaPradakshina, measuring about250 feet(E-W) and 160feet(N-S).This enclosure contains shrines to house Varadaraja, and narasimha .The Kalyana mantapa(80×36) and kitchen are also here. The third enclosure is the Mukkoti Pradkshina, which encloses the sanctum. Presently, it is rather difficult to identify it as an enclosure. The width of the enclosure is uneven; and the enclosure is open on only three sides. The path in the south (on the right side of the deity) is seven feet wide and twenty feet long; while the path on the other side(towards the left of the deity) is seventeen feet wide and ninety-two and half feet long. This skewed position of the sanctum within the Brahma bagha was perhaps to satisfy the requirements of the temple vastu norms. In the case of Sri Rangam an entire township was placed within the well laid out rectangular temple complex. The prakaras or walls that fortify the temple may vary in size and number according to the dimensions of the temple. Larger temples, like the one in Sri Rangam, are sometimes surrounded by up to seven concentric walls , said to represent the seven layers of matter-earth, water, fire, air, either, mind and intelligence-that cover the original consciousness of the living entities in the material world. Jaipur was another city which was laid out according to Vastu Shastra, with the Palace and temple at the centre; and roads with East-west and North South orientation.Roads running in Eastern axis ensure purification by sun rays; and the roads running North South ensure circulation of air and cooler atmosphere. To start with the Vastu mandala of the entire village needs to be drawn and the location of the temples to gods, Vishnu and others be fixed. Here, the layout of town, its size, breadth of different levels of streets, locations and sizes of facilities like water tanks are determined based on the size of town.Then the location of temple (Brahma sthana) in the town is decided. Temple is usually in the center of village. The entire arrangement is called grama vinyasa. The thumb rule is , the area demarcated for the temple at the centre should at least be 1/9th of the total area of the proposed township. There are, different types of Vastu Purusha Mandalas depending upon their applications such as residential buildings, palaces, auditoriums, temples etc. About 32 types of Vastu Purusha mandalas are enumerated, the simplest among them is with one square. But the most common ones are those with 64 squares (padas), 81 padas and 256 padas. They are called Manduka, parama-saayika andtriyuta, respectively. As for Manduka Mandala (8×8), the whole square would be divided by the two axes that go North-south and East-west. In the case of Parama Saayika Mandala (9×9), the entire squire would be unevenly divided. Among these, the different texts such as Marichi, Maya-mata and Vastu-Vidya have their slight variations. To summarize their position on the question of locating the Vishnu temple within the town; a shrine may be constructed in the centre of the township or on the western side; but always facing the town. When it is in the centre, the site – plan should provide for locating the shrine at the North-western direction within the Brahma bagha.The Vishnu icon may be in any posture: standing, sitting or recumbent. Vishnu may be single or accompanied by the two Devis. The sanctum may house only the Dhruva and Kautuka Bheru (immobile) idols. It is best if the temple complex has nine, six or five forms of Vishnu installed, if one can afford; else, a single icon of Vishnu would suffice. As regards constructing temples and their orientation in already existing village or towns three principles are generally followed: First, the temple should face the rising Sun in the east. Second, the temple should face the centre of the town or village. Third, the deity in a peaceful (shanta) aspect should be located in, and facing towards the place where people live, and wrathful (urga) aspect should be situated outside and facing away from where people live. In certain exceptional cases a temple may face south, provided it faces a natural formation say a hill or a water body . The temples and images to be turned away include Narasimha and Rudra. Siva should be turned away except when situated in the east or west. The proper place for Siva temples is in forests and mountains according to one text. The direction of a temple is according to this triple orientation – towards the Sun, towards the centre, towards man. The majority of the preserved temples do face the east, but it is not necessary that they physically must. The other directions can be described as \being east. To the tantrics who have some obscure symbolism about Sunrise in the east, south, west and north relative to ones spiritual evolution; any direction may represent east. Most temples face east, west is next best, even south is permissible but they definitely should not face the north. Where it is impossible, for some reason, for the temple to face the town, this is remedied by painting an exact likeness of the sacred image in the Garbhagrha upon the wall of the temple facing the desired way towards the village. B. Other pictures from Internet. Dear Ramachandra , thank you for the visit and for the appreciation. Please do read the other articles in the series and let me know. Thanks for the visit , appreciation and the recommendation. Thank you Kamas for the appreciation. Thanks for the visit and the appreciation. I , of course , blog on WordPress platform. That is evident. Please get in touch with the site managers for assistance. I enjoyed reading well written/ documented article. this subject for ages and yours is thee best I have discovered so far. Thanks for the visit and the appreciation. Please do read the entire series of articles . That might help you better. Yes; the articles are based on old texts and books of reputed authors , which I regard as authentic. I did not quite understand the remark about ‘conclusion’ Please amplify. I could not make out the latter part of the comment. Glad to learn that you found this useful. as also those on the subjects categorized on your right side on the webpage. the various temps for preparing the sthala sre qiuite interesting. yes, a number of old towns and cities, including the temple town of tirumala were according to vastu mandalas. even the old bangalore town was laid with the vishnu the four hundred year old (kote venkataramana swamy , facing east) temple and the fort at the centre. the north was marked by anjaneya temple (opposite state bank of mysore), the north west was the water tank (dharmambudhi tank which breached , dried and made into the central bus terminus) and the grama devata annemma was also in the nw (opposite kapali theatre). the west was guarded by hanuman (gali hanumantha on mysore road). at the south was the burial ground, the kempambudhi tank and the shiva temple (kshetra pala) viz. gavi gangadareshwara temple. the four mantapas marked the outer peripheries of the town (one of such mantapa can be found on the lal baugh emaciated hillock). i did not mention this because i could not get hold of the old bangalore map. 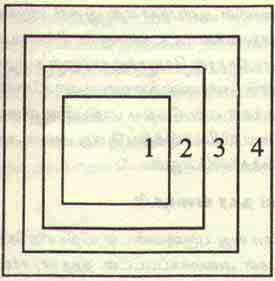 as regards the vastu purusha mandala, it is in part three.the simplest , one square was yajna kunda. even the chess board with 64 cells , it is argued< is a manifestation of the famous vpm. thanks for reading. please do follow the rest of the posts and let me know. great article. thanks for putting together such valuable information. i would like to get more details on the design layout of hindu temples. 1) how would a multi-deity) temple be designed keeping the vasthu as well as the agamic shastras in mind? 2) how can we bind the north indian and south indian traditions so that united it can be called a hindu temple? 3) can a temple be built without a presiding deity / deities? 4) can a sannidhi be built without mukha mandapam? any leads and answers will be greatly appreciated. dear vg, thank you for asking. i am glad you framed pointed -questions. the temple structure, layout and placement of the various deities within the temple complex, is worked out in relation to the nature of the principal deity; and the agama tradition with which it is associated. the major branches of the agama are the shaiva, vaishnava and shaktha. there are classifications within each tradition. each has its own configuration. please read temple architecture- devalaya vastu -part four (4 of 7) wherein i have briefly discussed the temple layout, in general. i have also provided the illustration of sri vaikunta-perumal temple at kanci (pancharatra agama); and another about the shiva temple at gangaikondacholapuram (mid 11th century). (please check under: positions and orientations of the temples). please check the diagrams i posted, and some essential aspects of temples. the post-gupta temple architectural styles were broadly classified as nagara, dravida and vesara. the temples of north india and orissa are generaaly called nagara, while those of the south india are dravida. vesara is a mixed style combining in itself the elements of the pure types , in a variety of ways ; and at the same time bringing in special features of its own ,such as : star shaped or octagonal raised platforms; very richly decorated and intricately carved exteriors; smooth , shining massive pillaras as if worked on a lathe; and richly detailed ceilings etc. the best examples of vesara are the hoysala temples (somanathapur, belur, halebedu and others) and the temples at pattadakal and aihole. 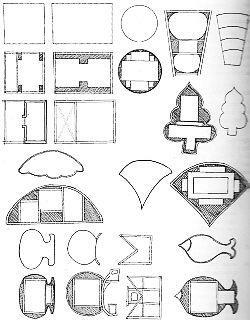 these classifications were not geographic divisions, but merely distinct styles of architectural expressions. the dividing lines among those classical styles have almost faded away, giving rise to integrated architectural creations with – each with a slight emphasis on one of the preferred pure styles. perhaps the balaji (birla mandir) at hyderabad, iscon temples or temples at us might be cited as examples. whatever be the innovation, those temples do retain the essential features of indian temples; and present the visual appeal, aesthetic beauty, the ethos and serenity of a hindu temple. as i mentioned, the purpose of a temple is the image residing in it. that image should suggest the virtues, glory, power, splendor and grace of the god it aims to represents. at times it might not be feasible to provide a physical representation of the special aspects associated with a deity. one such case is the shiva temple at chidambaram, deep down south. shiva at chidambaram is the akasha (the space) aspect of shiva. how does one represent space by anything other than space? obviously, one cannot .there is therefore no physical deity at chidambaram temple. the deity is the space; and space is the deity. but, otherwise temple without deity, is a building without purpose. 4. can a sannidhi be built without mukha mandapam? as you said, a typical south indian temple adopts a certain generally accepted layout; and, the garbagriha is followed by four types of mantapas or pavilions. but, those pavilions are regarded as extensions and not the essentials of a temple. the most important structure of a temple is the garbhagriha which houses the idol of the presiding deity. it is the very heart of the temple; and, its enclosures are supplementary in nature. some texts therefore argue that that the temple, per se, comprises only the sanctum and the tower on the top of it; and these two are the only essential parts of a shrine. some other texts say that the shrine extends up to balipeeta and no further. i hope i have answered your questions. please read rest of the articles in the series( and the comments –some which carry interesting discussions) ; and let me know. Beautiful article. One error to mention is that on March 20, 2015 at 6:33 pm you mentioned that the purpose of the temple was for the deity. that is incorrect. According to tradition and shastras and in particular agamas the tempel itself is a divine form and hence worthy of worship. the addition of murthy in a temple is relatively recent. There is a lot to say about the purpose of the murthy that is too much to write here but it is not what is typically thought of as the purpose. One example is chidambaram temple which was built with no idol and no idol was intended. In more recent years a nataraja was placed in the sanctum but it was not the original intention of that temple. There are other points to mention but overall this is a great and scholarly article. Thank you. I presume, you are referring to my response to one of the comments posted on the page. I trust, you read that response, in full. A Temple is a huge symbolism; it involves a multiple sets of ideas and imagery. Apart for what you mentioned, the image residing at the heart of the temple is its life; and is its reason. And, that image should suggest the virtues, glory, power, splendor and grace of the god it aims to represent. As regards the worship-deity at Chidambaram, the aspect Akasha (the space) representing Shiva is indeed the deity there. How does one represent space by anything other than space? Therefore, it is not correct to say ‘Chidambaram temple was built with no idol ‘. The very idea or the symbolism of Akasha is the deity there. Obviously, there is no physical deity at Chidambaram temple. The deity is the space; and space is the deity. Kindly read all the parts ( nine , in all) in the series; and do let me know. Considering your status and achievements in the field, I regard and value your comments very highly. My name is Aravind and I recently come across your blog while searching for some details about temple construction. Thanks for sharing so many information and hats off to your effort. I would request you to share Devalaya vastu article in Kannada version if you have that. When I tried to translate it is not very effective and that is the reason for request. Dear Arvind, thanks for reading. I am glad you found it worth translating. No. Sorry. I have not written a Kannada version . The reason is simply that I am unable to type Kannada. Even if I try to write it down it is not of much use , as my spelling is bad and handwriting is worse. May I suggest : Try to get the gist of a long sentence or section of a paragraph and write it down in shorter sentences . That might perhaps help. My fried Shri Kannan Rangachar has been following that method. Many times his translation reads better than my English version. Sorry. I have not been of much help. Please do read the the entire series. I would to thank you for this informative blogs and details. Very informative blog related to vastu that I have ever read…Great knowledge you have covered in your page so thank you very much…. The endorsement coming from an Expert Vastu Consultant like you is truly valuable. Can you please tell me in a Shiv Mandir complex where should the toilet unit and the pandits room be oriented ? Could you also please kindly tell me what would be the correct vastu orientations for the other spaces in a typical Shiv Mandir setup ? Apart from the essential shrines, a fairly large temple precint will usally have utililities like a kitchen (paka-sala), a store room (ugrana), a dining hall, and sheds for holding the temple chariot other essentials associated the temple. These structures are located in the outer prakaras (enclosures). The utilities of the type you mentioned would also be in the outer enclosures. Hello Sir, Thank you for the lucid and informative blog.